Harry Potter’s Nimbus 2000 may be the most famous witch’s broom in the world, but we gardeners have our own witch’s broom to be concerned about. A couple of days ago I noticed an unusual growth developing on our asparagus plants. It looked like a tuft of new green ferny leaves growing randomly on the stems. 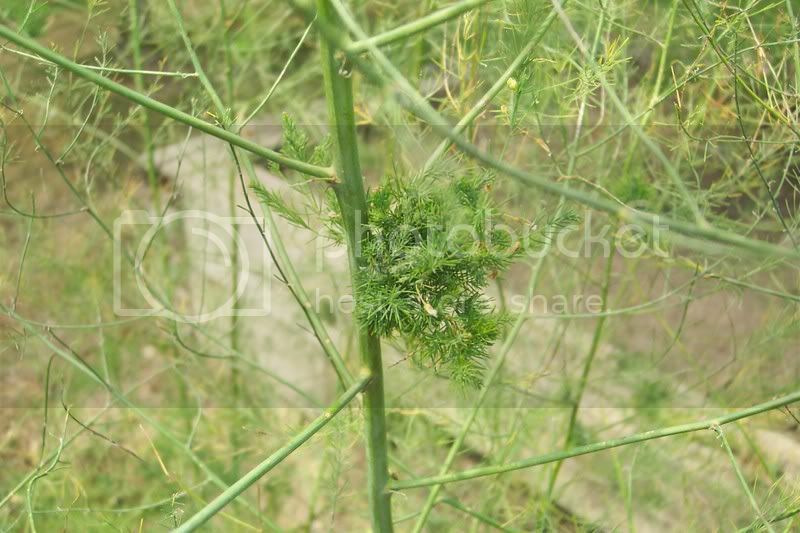 Due to its distinctive shape, I knew immediately that it was Asparagus Witch’s Broom. Witch’s Broom is a generic term used by plant pathologists to describe growth of this type. It can occure on plants ranging anywhere from potatoes to trees and have many different causes depending on the plant affected. In the case of Asparagus, the feeding of a small insect called the Asparagus Aphid causes this abnormality. If left unchecked, your Asparagus yields can be dramatically reduced. Many garden insecticides will kill this pest. Organic gardeners can use rotenone and/or pyrethrum to help control these aphids. Only the first several plants in one row of our Asparagus show signs of Witch’s Broom so now would be a good time to “nip this problem in the bud” before it gets out of hand. No playing “Quidditch” with this stuff. The garden of annuals that I take care of at work is looking very good right now. Its peak blooming season is July and August. It will have color in it even as late as early October if we don’t get an early frost. Though with nighttime temperatures in August in the low 50′s , I wouldn’t be surprised if we had temperatures in the low 40′s in September and frost before October this year. Be ready to cover your tomatoes! 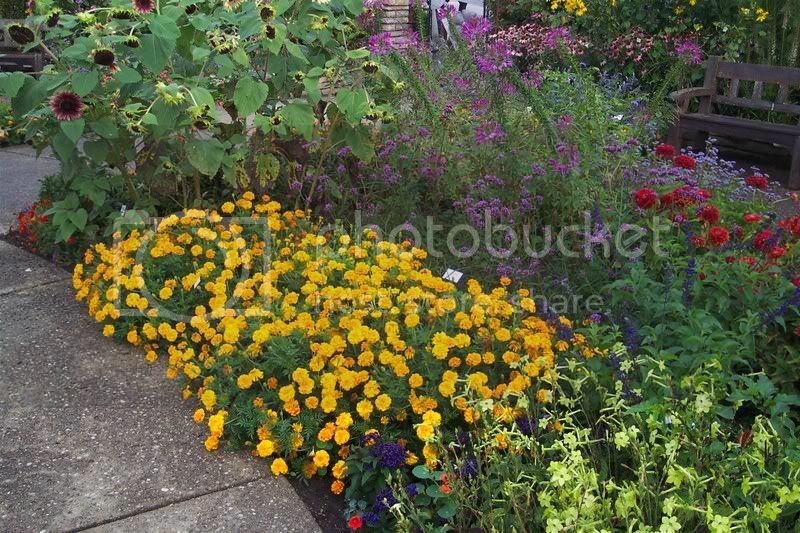 The flowering annuals are all in good shape. I haven’t noticed much downy mildew this season, which is usually a big problem for this garden. And the Zinnias are only now starting to get a little browning of the bottom leaves. That’s a disease called Alternaria Leaf Spot. . I am vey pleasantly surprised that the 12 ” tall reddish orange Cosmos called ‘Cosmic Red’ are blooming very heavily. We’ve deadheaded them three times this summer. So, they take a lot of work but each plant has 30 blossoms on it and looks quite stunning. Next to it is the tall blue Ageratum ‘Blue Bouquet”. 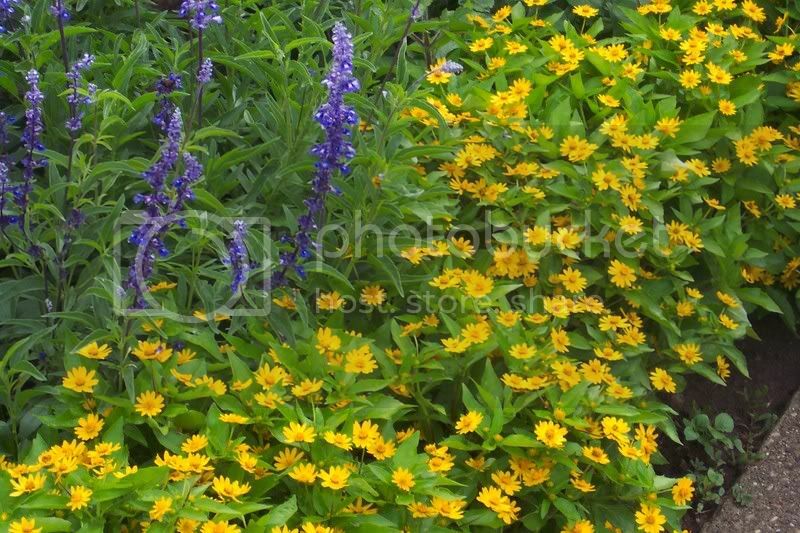 The colors do well together, plus I like to use some blue in all my gardens. Next to it is a short 10-12″ bushy Zinnia called Zinnia ‘Profusion Apricot”. 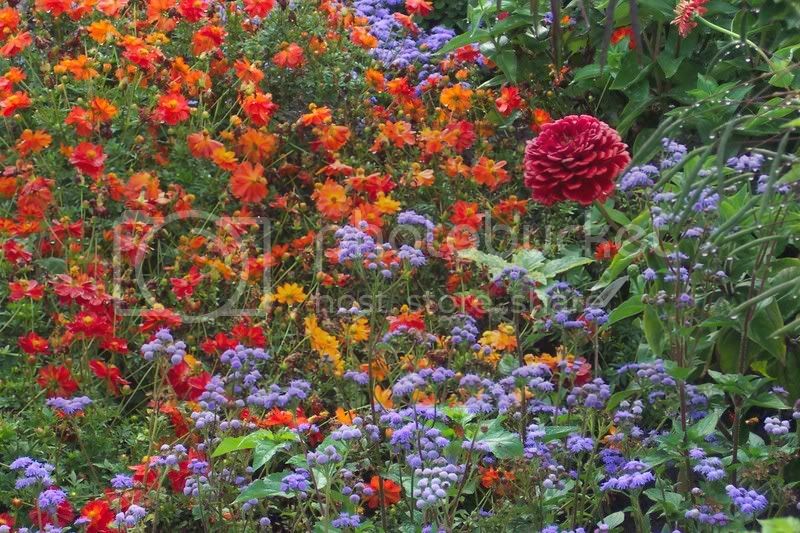 It’s full of 1 1/2 – 2 inch single daisy-like blooms of various shades of apricot. Just a little deadheading keeps the zinnia profusion series blooming well into the fall. The description in the catalogs says it doesn’t need deadheading at all but I do a little just to freshen it up. A King Fisher just “chuttered” overhead. He flew so close and turned his head to look at me so that you would think that he was trying to figure out what a human was doing in that garden so early! On the other side of this bed in front of me is a new marigold( to me anyway). It’s called ‘Fireball’. It is 18″ tall, orangey yellow with a little bicolor shading it it. It’s done very well and is full of blooms. Marigolds are another flower that don’t need deadheading but we do a little. I probably planted it 12″ apart so it’s nice and thick. That’s all for now. I’ll tell you about some more annuals in my next blog. If your onion stalks are starting to look a little yelllow and are begining to fall over, it means they are just about ready to harvest. Once they get to that stage, they’re done growing. To prepare our onions for harvest, we will knock over any stalks that haven’t fallen over yet on their own and let them dry a bit in the garden. After lifting them from the garden, we partially dry them in an airy place out of the sun for a couple of weeks. This drying process is called “curing”. 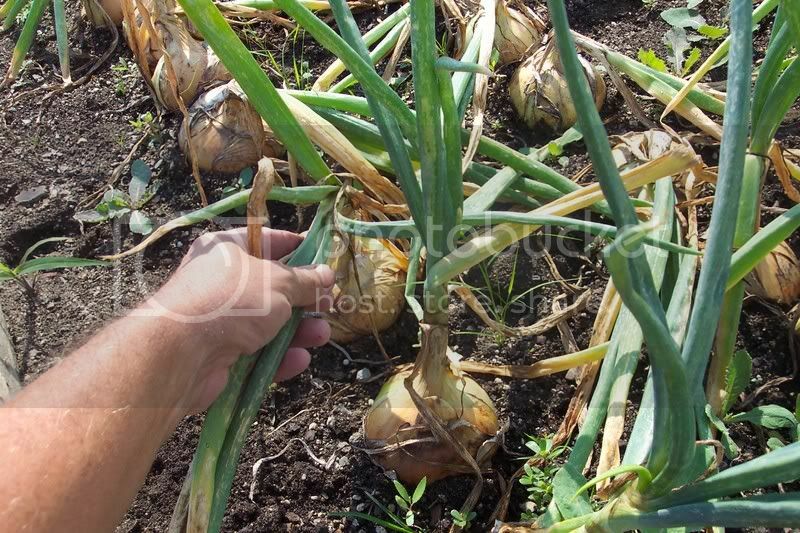 It helps the onion form that familiar onion skin which seals the inner part of the bulb and keeps it from damage. After curing, we cut off the dried stalk (leaving a couple of inches) and store them in a cool, dark place until we are ready to use them. If you store your onions, plan on using the ones with the thickest stalk first as they don’t keep as well as the thinner stalked bulbs. Also remember that some varieties will keep in storage longer than others. 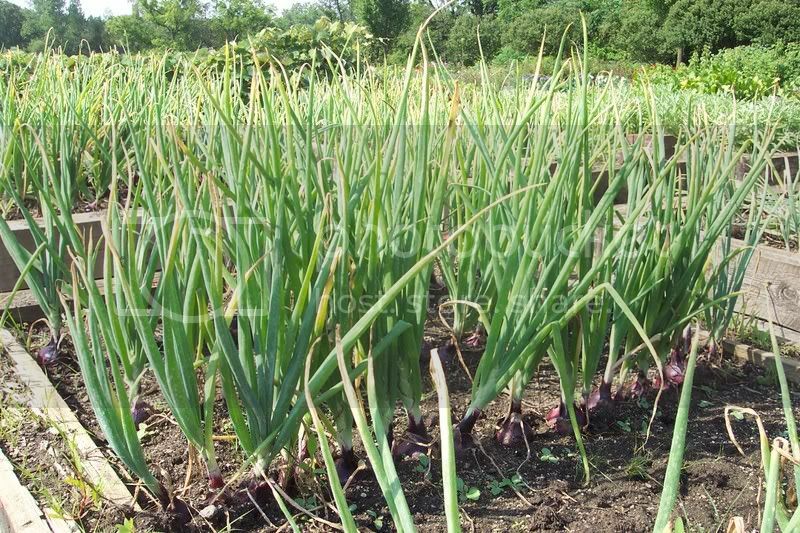 We always plant the “Copra” variety of onion for long term storage. It is a yellow cooking onion which is very pungent when eaten raw. When cooked, the Copra takes on a wonderful sweet flavor. The rest of our onions were selected for their taste, color or shape.